For this Ask the Experts Interview, I am speaking with Laurel Robinson from the Telluride Wine Festival. Laurel is the current Executive director.It turns out that Laurel is quite a Renaissance woman. Working at an event planning company in San Francisco early in her career was a great training ground for running an event. Having once been a caterer, a chef and nutritionist helps with running a food-based event. She is a production farmer that makes her own cheese and grows much of her own food. She has traveled extensively, seeking out culinary arts and techniques in hotbeds of gastronomy like France and Italy. At one point Laurel was even a commercial fisherman in Alaska. I think it is safe to say that Laurel is someone who not only loves food, but who understands the entire process of where food comes from and how it gets to your plate. Welcome Laurel. I have to say I was exhausted just hearing about your many life experiences. I talk about being a foodie but that is because I like to eat but you really have immersed yourself in learning about food. Aside from the eating and cooking, I could never do the things you have done. How did all of this lead you to take over the Telluride Wine Fest three years ago? Well even in all my travels and careers, I never really moved from Telluride. I would always leave and come back. Telluride is a beautiful place and a lovely community that I cherish calling home. For years I regularly attended The Telluride Wine Fest. Over the years it has had various directors and gone in many different directions. After awhile, I began to feel that the event was missing something. It occurred to me that given the opportunity, I could make changes that would be an example of my vision and that I could make them work. So I decided to buy the festival! I guess I wanted to take everything that I had learned and use it to breathe new life into the festival. I jumped in hoping to make it a truly great event and a wonderful experience for the participants. The growth in wine festivals has been meteoric to say the least. Did you think that the Telluride Festival was stuck in the same place it had been when it began? When you looked at the Telluride Wine Fest, did you see right away things that you felt could help improve the attendee experience? Telluride was the first wine festival in Colorado starting in 1981 and became the catalyst for many of the big wine events in the state. However Telluride has remained small over the years. The main reason is that Telluride is a very small community. When you only have beds for 3000 visitors and attendees and no camping available, making the event larger is not a viable option. So now the challenge is how do we make our event different, better. That’s where we set our efforts. Ok, that makes sense. This years upcoming festival will be the third in your history as director, let us focus in on some of the things that you have done to move the event in the right direction? Well I like to use the theory of “good to great”. We need to look at the good things we have to work with and make those work for us. Since we have the obvious limits we can never be the “biggest” wine festival in Colorado. And although that could be seen as a negative, in reality its a major plus for us. It will allow us to remain intimate which is better suited for the Telluride audience. Telluride has some definite advantages that come with being a small town. It is a well known destination that typically caters to a high end audience because of it’s reputation as the most beautiful place in Colorado. It attracts a very upscale visitor. That advantage expands the pool of vendors who are willing to come here even though the event is small. There is no shortage of vendors that want quality over quantity. Many vendors would rather reach a small, high end audience then a larger audience that is the wrong demographic. By appealing to so many wineries, we can attract the very best wines available year after year. That helps us keep ahead of the trends and also to be able to offer the very best products available to our audience. It is interesting that you mention trends. It is extremely difficult to be ahead of the curve on trends. Most people just end up following them, not leading them. It seems to me that this is a lofty pursuit. And it would also mean that each and every year you would be expected to be ahead of the curve. You have mandated quite a big task for yourself and your staff every year. Can you go into a little detail about how you plan to accomplish this feat? Well the concept is similar to a film festival. We look at hundreds of wine/food options and accept only those that we feel best follow our theme for that year or what we feel are the upcoming trends. Then we present these at the festival. Naturally for us to keep up with all of that on our end alone, would be almost impossible. That means reaching out to specialists in the field. So to that end we came up with using guest curators for the festival. These could include columnists, food critics, bloggers, etc. Selecting people who are immersed in their respective industries we will be relying on them for keeping the festival on the cutting edge of what is new. With the information gathered from these curators, we create the upcoming years show theme. So the wineries and food we choose this year will be totally different then the wines and foods we chose last year. Our thinking is that we give attendees a new experience each year by tapping the trends and the “what’s new” options. That way we present the best of those to our audience every year. It keeps every show fresh and topical. Best of all it gives our attendees a reason to return every year because their experience is always new and high quality. Do you find that attendees at wine festivals are already knowledgeable about wine and are not really interested in instructional events? Many people who attend our festival think they know about wine the way that many of us think we know about wine. We have found quite the opposite is true. Many of us really do not know much about wine. It isn’t our fault or for lack of effort but the wine business is very intricate and vast and full of partial information. Consumers have been told certain things like “assume that the more expensive wine is the best one”, but that is not always true. Or, maybe they find a wine that they like and select that every time because it is an easy choice. That isn’t knowing wine, what they really know is labels. At the Telluride Wine Fest we strive to teach people to look at a wine list and feel confident about their choices. No easy task because a wine list can be a very intimidating read. Hopefully the tools we give them empower them to make the proper selections. Armed with this knowledge, wine lists become more friendly. Our job, as we see it, is to give people the right tools so that no matter what wine list they look at, what wine store they buy from or what they want to pair with their food, the choices are clearer and more easily made. Certain things, like knowing any Cabernet from Stags’ Leap is always a good selection, is an example of what we teach. It’s all about empowering our attendees to make educated choices. We are not creating wine snobs, we are creating wine educated consumers, with real practical knowledge for any situation. We see that as our mission. Food items play a key roll in your festival as well. I see food and wine as a natural fit but you seem to have elevated it to another level. Can you explain what role food plays at Telluride? Let me just say that everyone eats. They may not all drink wine but everyone eats. For years, wine festivals offered snacks because they wanted to offer something to eat while attendees were drinking. At our festival there is a serious focus on food. Not only are food and drink good accompaniments for each other, it’s just about impossible, in our opinion, to have a great wine festival without great food. But rather than cheese and crackers, make the food an experience as well thought out as the wine experience. Lots of people want to be food educated as well. What are the new trends, what is the hot new fish or vegetable or latest way to serve food options? But also we make the food central to the actual experiences. For example, this year we have a 5 course dinner built around a sustainable caviar from Uruguay. Our palette pleasing adventure can be educational without even being a class or seminar. Plus it’s great for the planet. Again, we try to be an all encompassing experience for our attendees; not just a series of classes or seminars. What do you think is the one thing that separates your event from other wine festivals? I would think it’s because we do the work for you. We present an event that can be a feast for your mind and your palette without being preachy or boring. And our attendees know that they will be seeing new things. It will be filled with excellent food and wine selections in a beautiful setting. If you take just one thing from the event it is worth it but our attendees take more. Our participants get practical knowledge that they can take into the real world. It enriches their life in ways that they enjoy long after the event is over because it is knowledge. If I had to say what it is that makes us so special to our attendees it would be that. Do you have any advice for someone who might be thinking about starting a wine festival? Advice is that it is hard work and not glamorous. If you love to learn about Wine and Food, don’t start a Festival because you don’t actually have time to attend any of your own great events! Your event contributes to local non profits every year. You were telling me about the selection for this year and I love this idea. Can you share some information on the new partner selection for this years event with our readers? This years selection is very exciting to us. It is the Chef Ann Foundation. Chef Ann believes that every child should have access to fresh, healthy food everyday at school so that they can develop healthy eating habits that can last a lifetime. Their mission is to provide tools that help schools serve children healthy and delicious scratch made meals with fresh whole food. It is an excellent way to set children on the path to a healthier life now and in the future. Chef Ann is redoing school lunches with a heavy focus on non processed foods. That is extremely tough with the very limited budgets that schools get to work with but Chef Ann is showing them how. Right now she is working with the Berkeley and Boulder school systems providing better, healthier lunch for children. I think that certainly plays off your event mission. I love the idea. Too bad Chef Ann is limited to such a small area right now but hopefully, with you featuring her efforts, she will be expanding. This is a program that needs to get done yesterday. Thank you for bringing it to the forefront so we can learn about it. Laurel thank you so much for taking the time out of your very busy schedule to talk with us. I am sure that our readers will find this information very interesting and informative. Best wishes for a highly successful event! 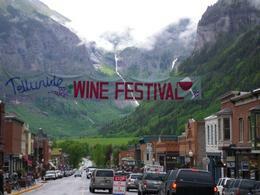 The Telluride Wine Fest takes place June 23-26 in 2016.